Before he even entered high school, Dan Haverty was schooling hitters in Golden Stick Yard League. Now – still not even 20 years old – the Woburn, Massachusetts native has the tools and makeup necessary to be one of the game’s premiere pitchers. In fast pitch competition, Haverty leans on a two-pitch combo of an overhand slider/riser and a sidearm drop. The former gets on hitters in a hurry. Due to its velocity, the pitch doesn’t move a lot but it also doesn’t need to in order to be effective. At the 2017 Fast Plastic Texas Open this past October, the pitch did lose some of its effectiveness as Haverty began to tire in the quarterfinals. The former standout high school wrestler brings that same bulldog wrestler mentality to the pitching rubber. Even as he tired in October, he found a way to gut through it and pitch Remember the Rookies into the semi-finals. His sidearm drop pitch serves as a great complimentary pitch and differs from his other main offering in arm angle, speed, and movement. Haverty has demonstrated a willingness to use both pitches in any count. The only downside to the combination is that the significantly different arm angles makes it easier for a hitter to pick up which pitch is coming. However, between the movement of the sidearm drop and the velocity of the riser/slider, Haverty is hard to hit even when the batter knows what’s coming. 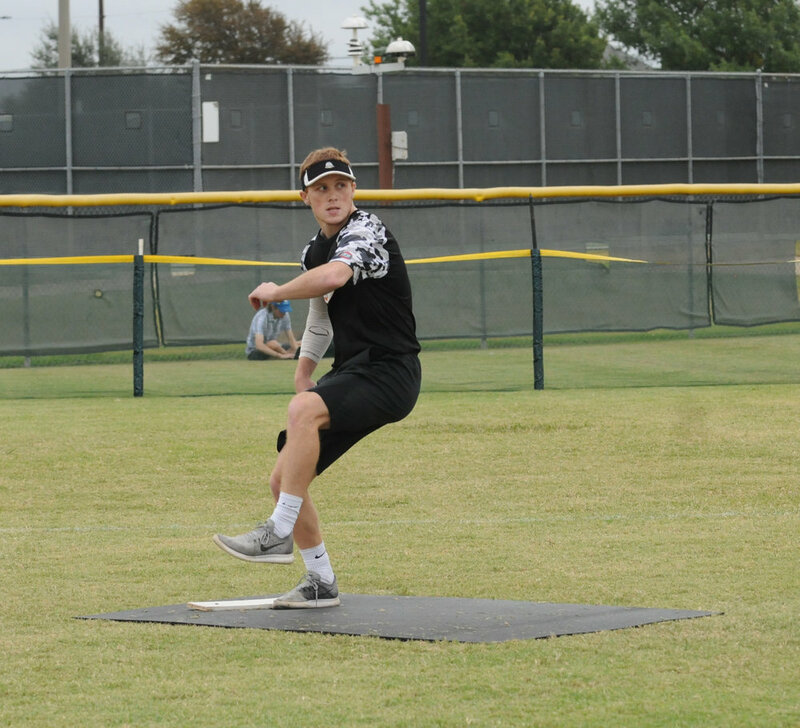 He handled the bulk of the pitching duties for the Rookies during round robin at the Texas Open and has the stamina to make it deep into tournaments. Although he has played and pitched for a while, concerns about an arm injury remain relatively low as most of his innings have come in a medium pitch environment and he is well-conditioned. Haverty is built like a wrestler which has translated into rather prodigious power in GSWL Yard League. His swing was a tad long through the zone at times during the Texas Open but his power should make him a valuable hitter even if his batting average remains middle of the pack. After years of leading his team, the High Rollers, Haverty joined Josh Pagano on the Founders beginning in July of last season and later accepted an invite to play with Pagano and the Rookies in Texas. With GSWL looking like a full-time Yard operation these days, it would be great to see Haverty make a trek to a fast pitch tournament or two this year. He certainly has the tools and experience to succeed in such an environment. So maybe Joel DeRoche was not quite as dominant as he was from 2003 – 2009 on Saturday, but that’s a rather impossible standard to be judged on. The right-hander – as he is accustomed to doing – handled the bulk of the workload for his GSW team and for the most part kept the opposition in check. For a guy that hasn’t played in nearly a decade, that’s impressive. Joel’s brother Ryan also seemed right at home back on the playing field. As the brothers exited the Shawnee Trail complex after the tournament, they were already bouncing around ideas on how to best simulate high quality, live tournament pitching so they are better prepared at the plate next go around. Watch out for them next year. There are few sights that make you think of a “Fast Plastic national tournament” quite like seeing Tim Dean leaning against a chain link fence while updating the master tournament bracket. Tim ran the old Fast Plastic National Championship Tournaments in Austin every year between 2003 and 2009. His ability to keep the tournament on schedule while simultaneously chatting with and making every player feel welcomed is as much of the FP national tournament experience as anything. Thanks to Tim, the tournament ran ahead of schedule the entire day. Whether in Austin, Frisco, or somewhere else, it would be hard to imagine a FP national tournament without him. Once upon a time, wifflers formed teams and then those teams traveled around to all sorts of different places to take in as many unique tournament experiences as possible. For the most part, Wiffle® Ball is a far more local experience now than in those days. However, there are some current teams – like Rochester’s Freaky Franchise – that take that approach to the game. This decade, Freaky Franchise has entered GSWL tournaments, participated in the NWLA leagues, participated (and twice won) the NWLA tournament, had players compete in Palisades, traveled to standalone tournaments elsewhere in the northeast, and now can add a Fast Plastic national tournament to their resume. Their willingness to travel and experience different styles of play sets them apart in the current scene. Only New Jersey’s Way Too Beautiful might be comparable in that regard. Although I am sure they were hoping for better results, the sport sure could use more teams just like them. Since FP last ran regularly in 2009 and utilized six-inning regulation games, there has been a trend towards shorter games. Very few organizations using FP-style rules had a regulation game length of more than five innings in 2017. Quietly, FP adopted a 4-inning regulation game (round robin) and 5-inning regulation game (elimination round) format for the tournament, similar to that used by MAW. The results were overall positive. With fewer innings to play, the games moved faster and arms remained fresher longer. For the most part, Fast Plastic stuck to its traditional rules for this tournament but the choice to adapt in this situation appears to have been a smart one. The wind was gusting all day long, sitting anywhere between 12 and 20 MPH. Naturally, the conditions impacted the play on the field. There were several wind blow home runs during the tournament plus a few moonshots that were no doubt aided by the elements. Remember the Rookies’ Evan Lazur hit a monster shot that cleared the center field fence and landed on top of a pavilion about twenty feet away on Field #4. The wind also impacted the pitchers. Both the Master Batters’ Will Marshall and Wiff Inc.’s David Wood noted to us that they had to pocket their drop pitches while playing on Field #3 because the horizontal wind kept knocking the pitch down. Nobody used the wind as an excuse and the elements impacted every team in some form or fashion. While there were undoubtedly plenty of sore arms and legs on Sunday (and Monday), we are happy to report that no serious injuries were reported during the tournament. The only player who may not have made it out of Texas unscathed was Remember the Rookies’ Josh Pagano. Between the semi-finals and finals of the tournament – during an interview with The Drop – The Rookies’ Lazur revealed that Pagano tweaked his leg while warming up to face GSW in a final four game, which necessitated that they reconfigure their line up. Pagano still pitched both the semi final and championship game, but there is clear video evidence that he did at time favour the injured ankle. The Rookies – as expected – never used the possible injury to explain away their title game loss nor did they even mention it beyond that one passing comment. The Texas Open served as a showcase for some of the more talented young players in the game. The rosters of both Jim’s Pub and Wiff Inc. were heavy on players under 25. 17-year old Ben Stant from Delaware is what you might call a “young veteran”, having competed in GSWL Yard League since 2014. In some ways it was a disappointing tournament for Stant, who threw only twenty pitches on the day as Jim’s Pub finished with a disappointing 1-3 record. Despite that, the future is bright. Earlier this season, Jordan Robles told us that Stant is the best “Yard League pitcher” he has ever seen. He also proved he could get it done on the mound in an unrestricted pitch environment in the Mid Atlantic this year by going 6-2 with a 1.53 ERA as a member of both Way Too Beautiful and the Barrel Bruisers. Stant’s teammate, Chris Sarnowski, fits into the same “young veteran” category. Competing in GSWL Yard since 2013, Sarno has proven himself to be one of the best Yard League hitters around. He has the pedigree to go with it, as his father is the former State of Mind star of the same name. El Hijo del Sarno sat out the 2017 season but will hopefully be a more consistent presence in 2018. The talent is there. Wiff Inc. was home to arguably the nation's best player under the age of 24 in Jordan Robles. The multi-talented Robles – who turned 23 just days before the tournament – is a threat on the mound, at the plate, and in the field. While Jordan would likely concede that his hitting lagged behind the other two facets of his game in Frisco, he still had what any impartial observer would categorize as a strong tournament. Robles is the Freaky Franchise of players – a player willing to travel to tournaments of all different shapes and sizes in order to play. This was evident in the results. Jordan led his teams to semi-final appearances at the Texas Open and in the Palisades WBL, a finals appearance in the GSWL National Yard League Tournament, and a championship in Mid Atlantic. Last but not least on the young players to watch list is the Rookies’ Daniel Haverty. Haverty handled most of round robin and the quarterfinals for his team and was arguably one of the best pitchers in the tournament. While he tired late, Haverty never gave in and successfully got the ball to Pagano for the semi-finals and finals. If Remember the Rookies return in some form in 2018, it wouldn’t be surprising if the highly athletic Haverty was given a more prolific role. One of the questions we posed in our tournament preview article was how well would the players with long layoffs perform in a high quality tournament? The answer is “generally, rather well”. As previously mentioned, the DeRoche brothers performed well and you do not have to squint very hard to see them doing even better next year with a little more practice (Joel and Ryan's practice time this go around is said to have been limited to one practice a week in the month leading up to the tournament). Their teammate Mike Cross had a strong defensive tournament and looked more and more comfortable at the plate as the tournament progressed. The Las Vegas Wifflers finished in the top eight and seemed to be a pitcher away from a higher finish. The veteran Rookies looked like they hadn’t missed a beat. It was a mixed bag for the Moonshots – comprised of former Viper players Randy Dalbey and Jim Balian and veteran California players Sylvie Serrano and Robert Colon – who went 3-3 en route to an 8th place finish. The Moonshots were solid, but missing the extra spark that defined the Vipers during their back-to-back championships in 2002 and 2003. An 8th place finish is nothing to scoff at but given the talent on this team it feels somewhat lackluster. While winning total base games it not exactly a function of luck, teams are definitely playing with fire when they leave the outcome up to such a flimsy metric. A couple of walks or an infield hit could and often does decide the difference between a win or loss. Seven games during round robin were decided this way. The eventual champions, Cloud9, started their run with back-to-back total base wins versus GSW and the upstart Cosby Show. Both games were scoreless and a couple of walks and hits in the other direction could have greatly altered the rest of the tournament. Cloud9 wasn't alone in using a couple of total base victories to jump start a deep run in the tournament. Their title game foes - Remember the Rookies - also won two games decided by total bases, as did the seventh place Master Batters. On the opposite end of the spectrum, GSW was the hard luck victim of a pair of total base defeats. With so many games decided by the most narrow of margins, its probably safe to say that if the tournament was played over 100 times the actual results might not be repeat even once. The tournament champions, Cloud9, were in quite the celebratory mood following their big victory. How could they not be? With $5,000 in their hands, not to mention the tournament trophy, the champions gladly posed for photos on the field after being congratulated by many of the approximately 100 spectators that watched the tournament finale. After receiving their spoils, the Cloud9 foursome celebrated by breaking open four beers, only some of which found its way into their mouths. Why beer and not champagne? As tournament sponsor Jon King put it - like only he can - "I thought about getting champagne but this is Texas. We drink beer in Texas." On the other hand, the tournament runners up - Remember the Rookies - weren't in quite as festive of a mood after coming so close to the title. The disappointment was palpable. When the Rookies received their second place plaque, one of Josh Pagano's children quickly grabbed it. "It's all yours, buddy," Pagno told him. "You can keep it," one of the Rookies added from the sideline. "None of us are going to hang it up."